When we hear the word “Drone,” we may get several thoughts in our mind like racing, photography, toys, etc. But, the drones can also be considered as an important computing platform for the future. This amazing Intel Falcon 8+ is mainly used for commercial purposes such as Volumetric 3D measurements, Geo-Referenced 2D and 3D information, Building Surveying and modeling depending upon the camera payloads that are used. The Falcon 8+ is an advanced octocopter designed with safety, performance, accuracy and positioning itself at the forefront opportunity to provide the sensor communications and cloud integration for the growing drone ecosystem. In the commercial drone industry, the AscTec Falcon 8 drone set the remarkable trend. The Falcon 8 offers the best performance,weight-to-payload ratio, and its exceptional stability even in the harsh conditions. Now, With the more latest and advanced features Intel announces the release of new Falcon 8 plus in the North American markets. The Intel Falcon 8+ is the first Intel-branded commercial drone with many incredible features, and this unit includes with the Intel Falcon 8+ UAV, Intel Cockpit for ground control, as well as the Intel Powerpack to power the UAV. Check out Intel Falcon 8+ Price and Features, Specifications in the following section. The Intel Falcon 8 plus is the latest Ready-to-fly professional octocopter used by commercial and industrial service providers. This drone provides the full electronic system redundancy, and it features includes the redundant batteries and offers an excellent communication between all the flight components and sensors. The UAS has automated aerial sensing solutions with the accurate onboard sensors. Falcon 8+ is best applied to smaller scale projects, as it offers flexible take-off and landing. Due to its best-in-class sensors and active compensating camera mount, the Falcon 8 plus is well suited for mapping and inspection of projects up to 35 hectares that require high-resolution imaging. It also offers the consistent waypoint automation enables exactly reproducible flights for valuable structural analysis. A triple redundant autopilot with three inertial measurement units compensates for the hardware failures, external influences like electromagnetic fields and hard winds. Now Intel Focused on Create Innovative New Technologies in especially for the Commercial Drone Space. Unfortunetly this product not available in Amazon.com. 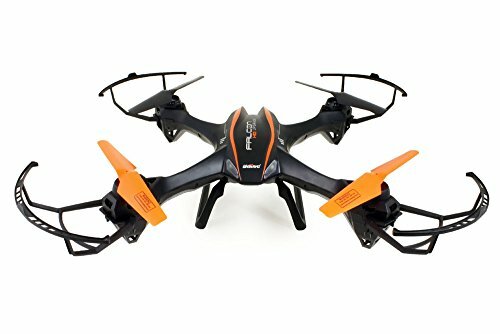 UDI RC U842 6-Axis Gyro Falcon RC Quadcopter with HD Camera is the latest commercial drone available in the Amazon. Get complete details of Falcon UDI RC U842 RC Drone Price, and follow us to know Intel Faclon 8+ Drone Price, latest updates here. Do incredible 3D flips and rolls with just the push of a button! The Intel Falcon 8+ is a Ready to fly drone, and it offers an HD camera with 36 megapixels resolution. The Falcon 8+ gives the crystal clear image quality and gives the clear view of in the surveillance of machines and aerial pictographs. Intel introduces the great speed UAV ith 34 mph. This high speed drone can be used in various applications like Construction progress and mapping, Visual inspection of structural integrity and it is highly beneficial for the industrial purpose. The newly designed Intel Cockpit features a water resistant, robust user interface. It can be used in even in harsh outdoor environments. With the integrated Intel tablet, drone operators can plan and execute highly complex missions with ease. The Intel Cockpit integrates independent control and safety features with low latency digital video, i.e.,5.1Ghz to 5.8Ghz. This supports payloads with up to 1080p and provides the real time fly view. The cockpit is user-friendly and it can be easily accessible with single hand flight control joystick. The smart Intel Powerpack batteries charge the Intel Falcon 8+ and the Intel Cockpit and combine the efficiency with industrial standards. The battery features the automatic balancing, storage mode, charging and LEDs that display remaining battery life. It provides the flexible and Portable access and meets the airline shipping requirements of batteries. It provides quick access to the high-resolution images as well as it is very easy to fly. One can easily fly this drone without much training. The AscTec Falcon 8+ is capable of withstanding winds up to 10 meters per second. However, rain weather limits the drone’s capabilities. Our drone carries a thermal imaging camera, which can help us to identify the people in the rubble who are still alive The drone was also used for tracking down the bodies after the natural disasters like tsunami, floods, and earthquakes. The drone assist us in locating them. Capture the areal photographs by the drone and then transfer it to our personal computer. Then, compare these images to images from Google Maps. This allows the team to make quick decisions in identifying the best places to set up the fields like hospitals. The Falcon 8+ has the ultimate flying capacity, the flight time of this drone is 26 minutes, and it can fly upto 4000 meters high above the sea level. The main purpose of the Falcon 8 + is for the commercial purpose and industrial surveillance. So, Finally Intel announces the latest commercial Falcon 8+ drone with the many exciting features. But, the price would be a bit expensive. The cost will be around $35000. Hope Intel set a new trend in the Drone industry. Nice machine, however, over priced @ $35,000.00.